North Korea’s transition to third-generation Kim leadership appears to be going smoothly, indeed much more smoothly than many outside observers had expected. This should not be a surprise to anyone familiar with the history of the DPRK, which ceased to be a “normal” communist dictatorship decades ago, and instead became a regime of hereditary leadership, firmly centred on the Kim family. The question was never whether or not a son of Kim Jong Il would become leader after Kim’s death, but which son it would be. As Kim Jong Il’s own rise to power shows us, leadership succession in the DPRK is not based on hereditary privilege alone. Kim Jong Il had to prove his ability and his loyalty, and to compete with other contenders for the throne from within the Kim family. Kim Jong Il’s most serious competitor appears to have been his uncle, Kim Il Sung’s younger brother Kim Yŏng Ju. Ultimately Kim Jong Il won out in this intra-familial power struggle and gained the support of his father for succession in the early 1970s, when he was around 30 years old, roughly the same age Kim Il Sung was when he became North Korea’s leader in 1945 and that Kim Jong Un is now. By the 1970s, North Korea had become a family state unlike any other in the communist world. The DPRK in this respect was more like Saudi Arabia or a Gulf Emirate state than East Germany or Vietnam. Closer to home geographically if not ideologically, Taiwan and Singapore both saw transfers of power from their founding leaders to their sons in the 1980s and 1990s. But among communist states, which generally decried hereditary succession as “feudal” (as did North Korea itself until hereditary succession became official policy), the Kim family’s inter-generational power transfer was unique. Perhaps the Ceausescu family of Romania came close to such a monopoly of power toward the end of the communist regime there—Elena Ceausescu was allegedly slated to succeed her husband before their execution in 1989—but Nikolai Ceausescu had long been inspired by Kim Il Sung’s leadership style, not excluding familial rule. Although such a move was unprecedented in the communist world, selecting Kim Il Sung’s eldest son to succeed him fit logically with North Korea’s evolving political culture, which had moved increasingly away from communist orthodoxy since the 1950s. 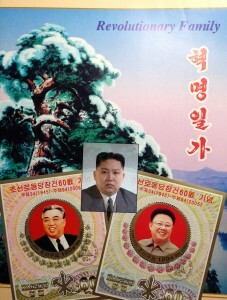 Even in the earliest years of the regime, North Korean propaganda noted Kim Il Sung’s “revolutionary lineage” (hyŏngmyŏngjŏk kagye) as one of his qualifications for his leadership. Kim, in contrast to Stalin or Mao, did not become a revolutionary out of rebellion against his father, but carried on his father’s own revolutionary (that is, nationalist and anti-Japanese) world-view and activities. Beginning with the example of the Great Leader, North Korean propaganda increasingly stressed filial piety as a key virtue. Korean culture—even (perhaps especially) in North Korea—has long placed a supreme value on filial piety and obedience to elders. Unlike in China during the Cultural Revolution, North Korean ideology simply had no place for rebellion against one’s parents. The other side of filial piety is the belief that parents’ values will inevitably pass down to the next generation, for good or ill. Thus, children and grandchildren of landlords and pro-South Korean collaborators still face discrimination in the DPRK, and conversely descendents of revolutionaries and Korean War heroes are held to be politically and even morally superior. Given this logic, Kim Il Sung’s family was the ultimate “good” family, and being raised in the bosom of the Great Leader gave Kim Jong Il the ideal background for leadership himself. As the cult of Kim Il Sung and his family became ever more entrenched in the DPRK, it became increasingly unlikely that anyone would question Kim Jong Il’s right to succeed his father once the Great Leader had put his imprimatur on it. In his own way, Kim Il Sung had solved the problem of political instability that had plagued other communist states following the demise of their founding leaders. Post-Kim Il Sung North Korea was to have many profound problems, but unstable leadership succession was not among them. A list of blood relatives and in-laws of the Kim family, compiled by the Soviet embassy in January1974, gives a sense of the “Kim family regime” already in place in the early 1970s: in addition to Kim Jong Il and Kim Yŏng Ju, there was Kang Yang Uk, the Protestant minister related to Kim Il Sung’s mother, who was Vice President of the DPRK; Kim Il Sung’s second wife, a member of the KWP Central Committee; and Foreign Minister Hŏ Dam, the husband of Kim Il Sung’s cousin. Another cousin was the Vice President of the Academy of Social Sciences, Kim’s brother-in-law was Second Secretary of the State Party Committee of Pyongyang, and several others family members occupied leading positions in the party and state. The Soviets did not have a particularly flattering opinion of Kim Jong Il himself. In January 1976, a Soviet diplomat in Pyongyang reported to an East German colleague that Kim Jong Il’s university record had been distinguished not so much by “particular talents or accomplishments,” as by a good deal of consorting with female classmates. In fact, the younger Kim had hardly studied at all and barely passed his course (in contrast, the official hagiography of Kim Jong Il has extolled his “unparalleled genius” as a student). Nevertheless, the Soviets were certain that by 1975 Kim Jong Il had already been chosen as Kim Il Sung’s successor. Although the younger Kim was not yet in authority, there was really no other competition after the elimination of his uncle Kim Yŏng Ju, nor anyone with the equivalent experience in the party and state apparatus. Kim Jong Il may not have been an intellectual giant, but he had a consummate talent for ruthless political manoeuvring. In this respect he was very much like his father, who had manoeuvred his way to leadership under the Soviet occupation thirty years before. We can assume Kim Jong Il saw this political ruthlessness in his own son, and that this was a major factor in the choice of Kim Jong Un as his successor. Kim’s final step toward official succession was receiving the Order of Kim Il Sung in 1979. Like the Order of Lenin in the USSR, the Order of Kim Il Sung was the highest award granted in the DPRK. It was established in April 1972 on Kim Il Sung’s 60th birthday, under the auspices of the Central Committee of the Korean Workers’ Party. According to Kim Jong Il’s 1985 biography, the Central Committee, “in compliance with the unanimous wish of the Workers’ Party of Korea and the Korean people,” wanted to give the first award to Kim Jong Il. The young Kim modestly declined, and the decoration remained unawarded for seven years. Finally, in April 1979 Kim Jong Il accepted the award. The following year, Kim Jong Il’s rise to leadership went public at the Sixth Congress of the Korean Workers’ Party, convened October 10–14, 1980. The younger Kim was appointed to the second-highest rank in the Secretariat after his father, the third-highest rank in the Military Commission, and the fourth-highest rank in the Politburo. No North Korean leader other than Kim Il Sung had achieved such high positions in all three organizations simultaneously. Kim Jong Il had become the number-two person in the entire North Korean leadership system and the unassailable heir to the throne. Indeed, there cannot be a patriot, who would not love and respect his parents. Any patriot loves his parents, wife and children above all. These feelings are not only connected with the persons near and dear, they are closely bound up with the motherland’s destiny. The “Kim Family Regime” was established over thirty years ago and has survived intact to this day. There have been ups and downs in the hierarchy, and struggles for power within the royal family and the upper echelons of the Party and the military, but the basic principle of hereditary succession has never been in question. Power is directly related to one’s access to the ruling Kim(s), and therefore the chances of a frontal challenge to the current Leader from within the elite are extremely remote. Nor is the ruling Kim merely a symbolic monarch; despite Kim Jong Un’s youth and relative inexperience, he is steadily amassing titles and—apparently—real authority. Speculation about instability, elite fracture, or coup d’etat (much less a popular uprising) is just that: speculation, without a shred of evidence. Of course it is impossible to prove that nothing is going on behind the scenes, but everything we have seen over the last several months suggests Kim Jong Un’s accession to power is going according to plan. The system Kim Il Sung put in place in the 1970s has remarkably successful in its primary goal, which was to keep his family in power for generations to come. GDR Embassy in DPRK, January 28, 1974. “Notes on Conversation with Comrade Samilov, Second Secretary of the Embassy of the USSR, 22 January 1974.” MfAA C6954. GDR Embassy in DPRK, February 3, 1976. “Notes on Conversation of Comrade Joachim Pohl, Third Secretary of the GDR Embassy, with Second Secretary of the USSR Embassy in the DPRK, Comrade Victor Alexandrovich Tibunsky, 20 January 1976.” MfAA C6854. Choe In Su, Kim Jong Il, The People’s Leader (2) (Pyongyang: Foreign Languages Publishing House, 1983), p. 375-9. The Mother of Korea: Biographical Novel (Pyongyang: Foreign Languages Publishing House, 1978), p. 108.